It's a kick for any artist who creates characters to see their creations realized as toys...and this was definitely true for me. 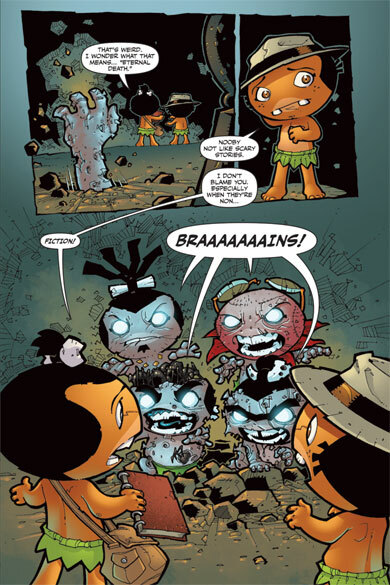 So when Funko approached Dave and I to create vinyl characters of the pygmies we jumped on it. They opted to create four large 5 inch viny figures and 24 smaller 2.5 inch blind box "Mysterio Minis" where the box would be opaque so the buyer wouldn't know what they were getting. 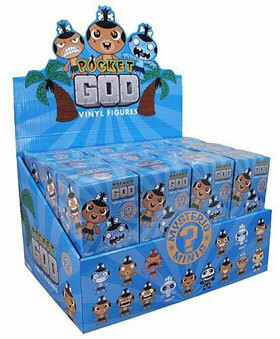 For the larger vinyl figures (shown above), we chose two classic pygmy expressions and two characters with brighter colors: a Zombie pygmy (a popular character) and the "Moon Witch" (a character in Journey To Uranus' mini-game "Decapithon"). 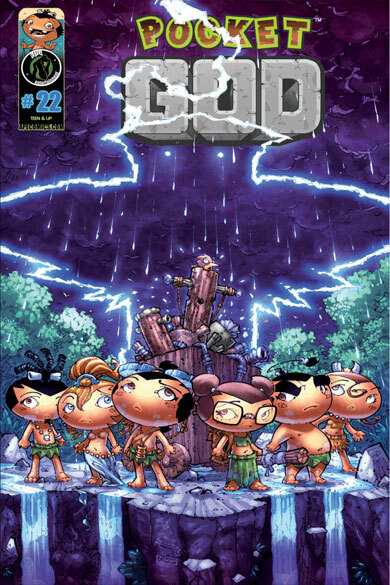 The 24 Mysterio Minis (some shown below) represented various versions of the pygmies throughout the games and marketing materials, including the "ginger pygmy", the "ghost pygmy" and the skeletal "hit by lightning" pygmy. Funko Toys' sweet spot is creating adorable toys, so my main direction to them was to do what they do best and make them as cute as possible. They wanted to make three body position templates to be reused for all the variations, so we worked out body poses that would work across all versions of the pygmies. 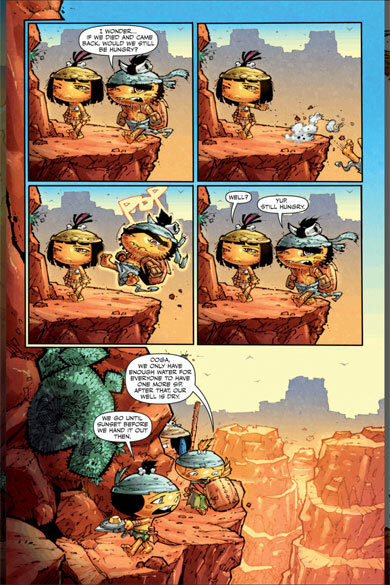 Funko's designers sent their illustrations that would become the pygmy faces and I red-lined them (marked up their art) to keep the pygmies on model and marry the humor of the game with Funko's particular flare for cute. The toys were distributed by Barnes & Noble and Amazon. Here's a toy commercial that we commissioned from Scott Young. 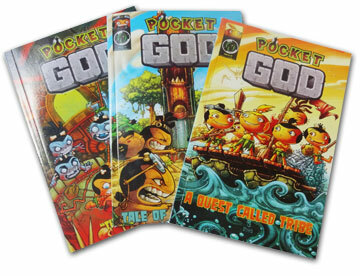 Ape Entertainment approached us to create a 4-issue comic based on Pocket God. Dave and I are huge comic fans so of course we had to do it. 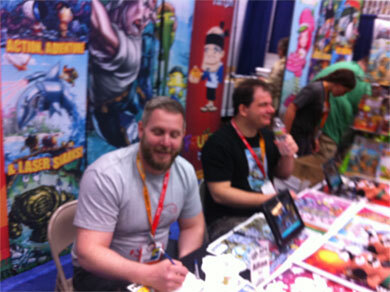 And when looking at the talent at Ape Comics, we could tell we could create something of high quality. I had already spent some time putting together a Pocket God story concept document to respond to other interest in creating an animated show. The game itself had very little story, but we were already growing the mythology in our heads in order to help us evolve the game. 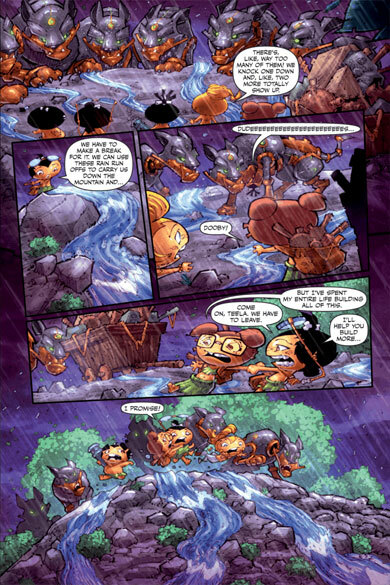 Since the point of the game was to be mean and kill the little guys, we determined that you weren't generating endless pygmies, but instead were regenerating the same 6 pygmies over and over again...So the story I pitched still had the pygmies being killed and regenerated endlessly, but now it was with the help of a magic gemstone called "The Gem of Life" which became the Mcguffin for the series. 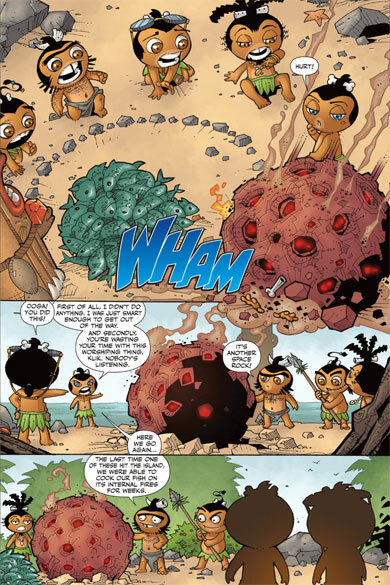 The story would revolve around Ooga, Booga, Klik, Klak, Nooby and Dooby discovering that the Gem of Life has been damaged, and in order to secure their safety, they would have to journey off their island to fix the gem. 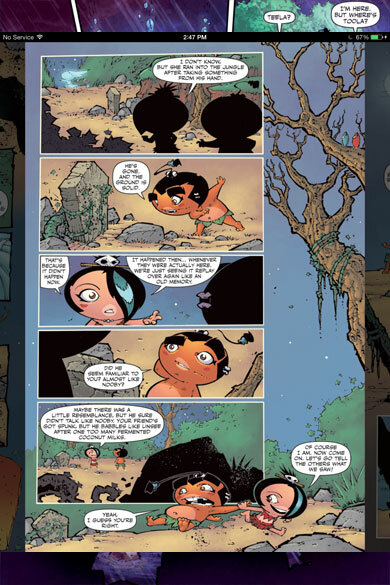 We wanted to mix the slapstick humor of Pocket God with an underlying mystery of the pygmies' existence (ala "Lost"). They would slowly learn about their hidden past, their destiny and the role of the gods in their lives. 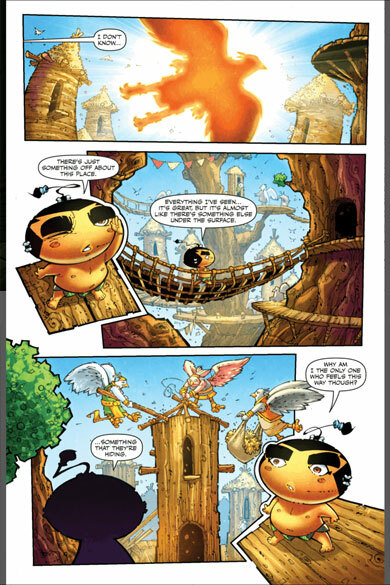 It was initially released as a digital comic on the app store and quickly became number one in books. 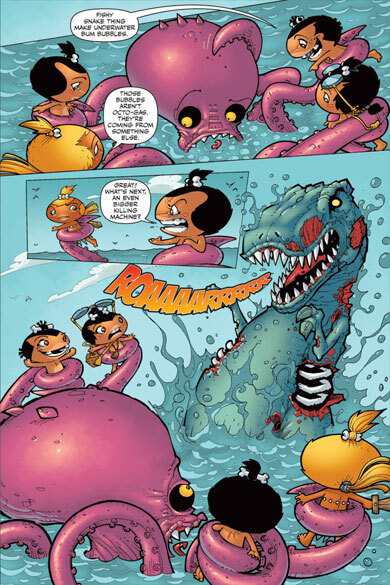 The success of the first four issues encouraged Ape (and us) to produce more issues. As of writing this, we are currently at 26 issues! 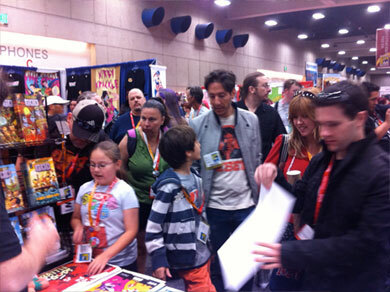 As we produced the comics, Dave and I were very hands-on...probably more than Ape expected. 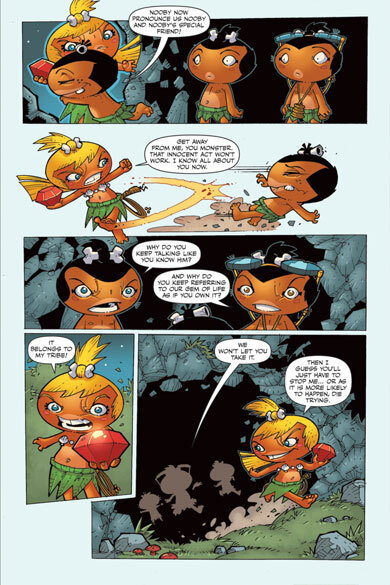 We worked closely with David Hedgecock of Ape and Jason Burns (the writer) to guide the story and build the world...To enhance the story, we created new characters including female pygmies. 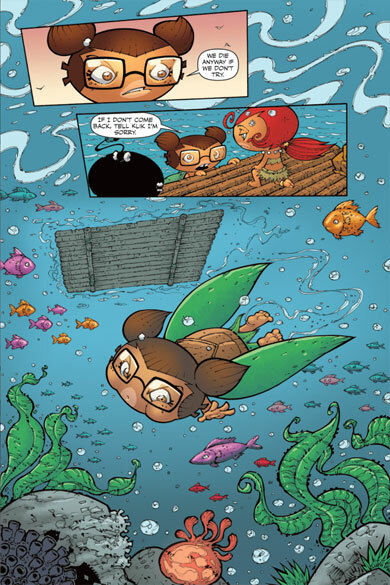 Much of the comic's success stemmed from Rolando Mallada's amazing art. He made every crazy idea we jammed into the story look completely awesome. He was integral in helping create look for the cast of characters, riffing from the original generic game pygmy. 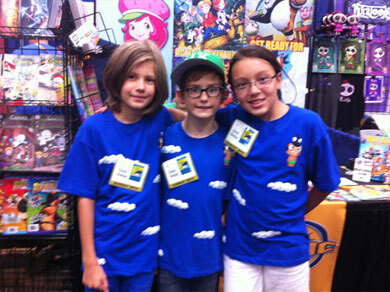 It generated it's own fan base who can be found on sites like Deviantart.com who love the characters. 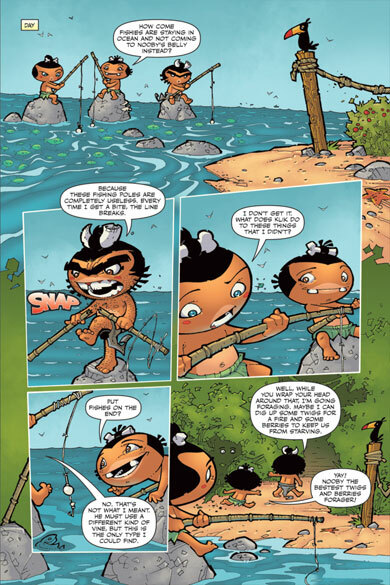 They even get creative and create their own pygmy tribes! 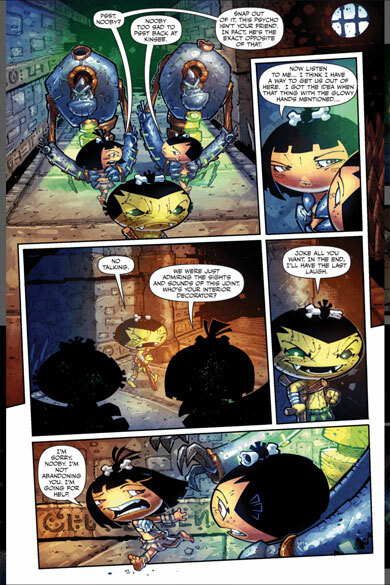 Across all issues, it's sold over a million copies on the app store and printed digest versions of the comics are also distributed through Barnes & Noble and Walmart. 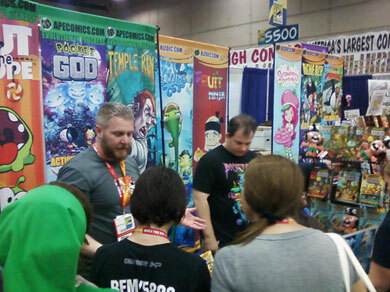 The last few years we supported the comics at the Ape Entertainment booth at San Diego Comic-Con and had a blast meeting fans of the app and comics! 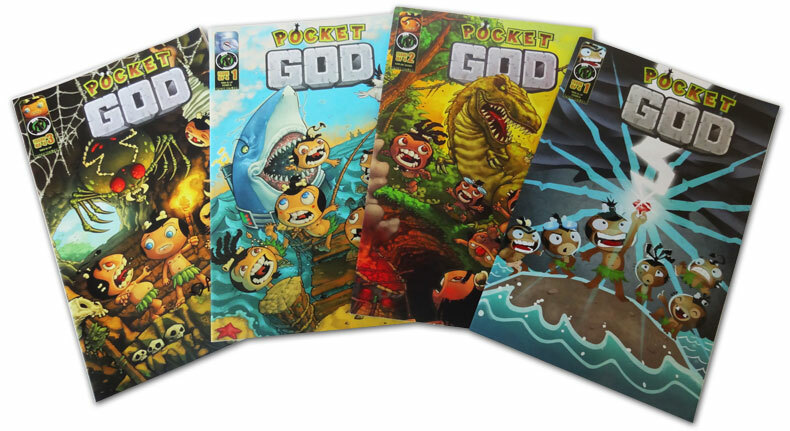 Even before we licensed our characters out to other companies, we self-produced items for the Pocket Shop on the Bolt Creative site for the fans.